Bold Jumper lady was peeping in my window yesterday. I wanted a moth on every finger, but couldn’t find enough. So I settled for bugs. But the green stinker wouldn’t cooperate, walked over the sphinx’s face, made him pee all over me, then walked over the saltmarsh moth’s face, peed on me himself, then flew off. Rude! Look at this little baby!!!!! This is another beetle grub, but you may notice this one is a bit different from the scarab grub I posted before (which has LEGS!). This baby looks like he’s swaddled up and wiggles around just as helplessly as if he was—this combination legless-but-with-a-distinct-head grub belongs to… a WEEVIL!!! This is my first weevil grub! Exciting! I put him back somewhere safe, don’t worry. These turds. The Cecropia babs!!! I kept more eggs than I should have (*gulp*) and I have given them the host plants I can easily offer: elm (lots of saplings popped up in my yard, yay, free trees!) and elderberry (tiny baby bush, less than a year old, in my garden). I really hope they at least accept the elm because I do not have enough elderberry for 50 Cecropia caterpillars. So far, they have only wandered around their enclosure trying to escape, no nibbles on the plants yet. I will keep my fingers crossed! I was pulling weeds in my yard in the middle of the night, like ya do, and I found A BABY curled around the roots of a common hedge parsley plant!!! I think I woke him up!! I put the weed back when I was done taking the baby’s picture. She’s here and she’s beautiful! I love her!!!! If you have not had the honor of meeting a Cecropia moth, they do this little gryration dance… constantly. I heard scratching inside the Polyphemus cocoons (you remember my fat green sausages?! ), and I took a peek. No moths trapped inside. Still troublemakers, just in pupa form. They should be adults any day now! @burningtrashnightmare asked about cutting the cocoons open! The cocoons keep them safe from predators and the environment. 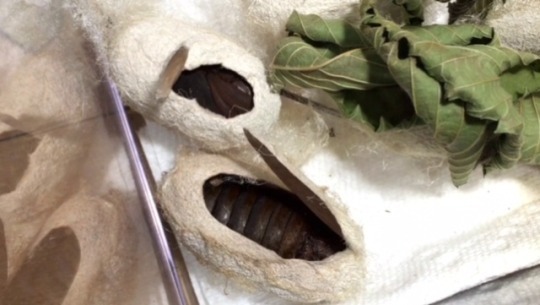 They made these cocoons in … November? December? It was months ago, in any case. The cocoons are semi-waterproof, but still breatheable, are sturdy, everything they need to stay protected in the wild. In my house, however, they don’t need to worry about baking in the sun, drowning in the rain, or getting attacked by parasites. I have had “naked” pupae sitting out for months, but as long as they don’t dry out (air conditioning is not a moth’s best friend! ), they are fine! There might be some issues with getting out of the pupa without the end anchored in the cocoon, but we’ll see!